Pope Tawadros will visit Kuwait on Sunday at the invitation of the emir in the first such visit to the Gulf state by a Coptic Orthodox patriarch, Egypt’s ambassador to Kuwait said Friday. 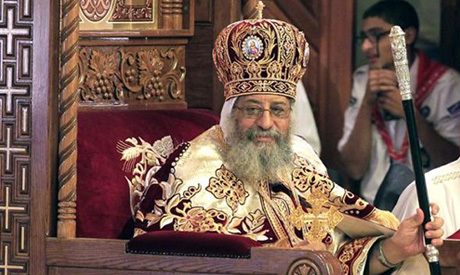 During the four-day visit, the Coptic cleric will inaugurate a new cathedral. Ambassador Yasser Atef told Egyptian state news agency MENA that the pope will also hold spiritual meetings and attend a celebratory dinner alongside the head of the Coptic Orthodox Church in Kuwait, Bishop Bishoy. Tawadros will meet the emir, Sheikh Sabah Al-Ahmed Al-Gaber Al-Sabah, to thank him for his support for the Coptic Orthodox Church, and will also meet with Crown Prince Sheikh Nawaf Al-Ahmed Al-Sabah, as well as Prime Minister Jaber Al-Mubarak. On Friday Pope Francis, the head of the Roman Catholic Church, will arrive in Egypt for a two-day visit, during which he will meet with Tawadros, as well as with President El-Sisi and other officials. Unofficial estimates put the number of Coptic Orthodox Christians in Egypt at around 10 to 15 percent of the population. An estimated 1-2 million Copts live abroad, with large congregations in the US, Canada, and several European and Gulf states.